Can you really lose weight and look great OVER-NIGHT? Party Girl Diet™ author Aprilanne Hurley shares her signature “Overnight Makeover” secrets live – with Good Morning Arizona viewers wanting to look their best 24/7. 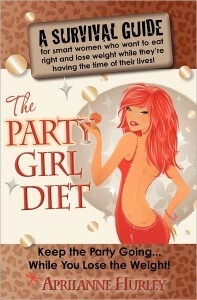 Included as a special feature in the Party Girl Diet™ book, Hurley shares her proven diet, lifestyle and weight loss secrets so you can “keep the party going and keep the weight off” with a look at super guilt free party foods from the Party Girl Diet book’s 3 -Day Kick-Start Plan. A frequent live guest on ABC, CBS, NBC and FOX Networks, Hurley is “on a mission” to share the Party Girl Diet’s secrets to “Super Health & Fitness” AND signature “Overnight Makeover” tips & tricks in order to help viewers be the best they can possibly be…OVERNIGHT. Hurley notes, “While you can’t change your body overnight…you can do a routine that will help your muscles look more toned and defined by nightfall – The Party Girl Diet’s FREE “Toned-by-Tonight” Workout featured on this page below. 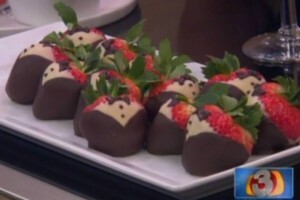 Special thanks to Ritz-Carlton Phoenix Executive Chef Garry O’Connor for creating The Party Girl Diet’s delicious party food spread featured on Good Morning Arizona – to include “Chocolate Covered Strawberries” one of many party snacks on The Party Girl Diet Plan. Special thanks to AZFamily TV-3 cast & crew for 2 super fun days on the set – and to The Ritz-Carlton Phoenix and Executive Chef Garry O-Connor for creating a super healthy spread of party foods for the Party Girl Diet’s Good Morning Arizona live TV appearances. Party Girl Diet party foods featured included freshly made guacamole and salsa, white bean hummus, and the Party Girl Diet Plan’s signature snack “Chocolate Covered Strawberries,” which were a huge hit with GMAZ cast & crew in addition to the grilled salmon, roasted asparagus, and prawn cocktail – all delicious foods on the Party Girl Diet’s Overnight Makeover. Click here for the dish on Aprilanne Hurley’s Revolutionary NEW Aloha Diet™ coming out in 2016.